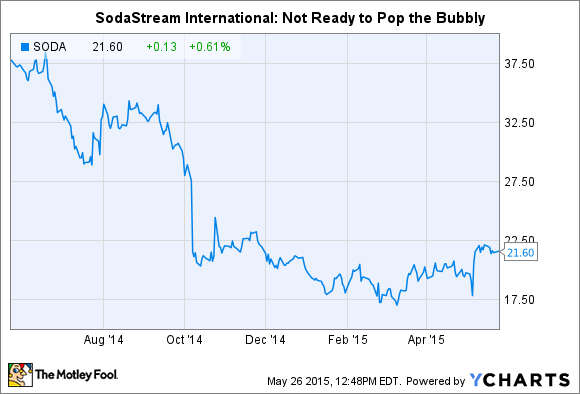 Is SodaStream International a Buy? The sparkling water maker has changed its focus and that clouds the drink maker's prospects. No doubt SodaStream International (NASDAQ:SODA) breathed a sigh of relief when rival Keurig Green Mountain (UNKNOWN:GMCR.DL) seemingly badly fumbled the introduction of its new at-home cold beverage system. What could have been a serious incursion on its turf and market share instead became a window of opportunity because of the delay in Keurig's new machine hitting retailer shelves and the high price it placed on the Keurig Kold. But that window will stay open only so long as Keurig eventually adjusts to market conditions and reactions, and that means the leading at-home sparkling beverage maker must be examined on its own merits. Unfortunately, the outlook suggests SodaStream International shouldn't be on anyone's buy list at the moment. The real benefit of the new Keurig Kold appliance is the plethora of drink options available, including teas, juices, and sports drinks. It may have priced itself out of the market by slapping a $300 sticker on the machine, but that can be remedied quickly enough. SodaStream's problem is wants to be an amorphous health and wellness company, and its new slogan, "Water made exciting," sums up the hurdles it faces. Water just isn't exciting, and bottled water, its new primary competitor, is huge by comparison. Bottled water consumption in the U.S. grew 7% last year to 34 gallons per person, according to the International Bottled Water Association, but that only puts the domestic market in 10th place in the world. It faces significant competition from global brands like Nestle, PepsiCo, and Coca-Cola, as well as smaller players such as National Beverage, which makes the leading canned sparkling water brand LaCroix. One key advantage SodaStream has is it plays to consumer concerns about the environmental impact plastic bottles have in the waste stream. By virtually eliminating the plastic bottle it should be able to gain adherents. Except that it seems to have hit a wall. Although it returned to profitability in the U.S. market this past quarter, it was illusory because SodaStream essentially stopped spending money on marketing as it bided its time waiting for its new products to hit the market later this year. But even the sale of CO2 canisters, which had been SodaStream's primary growth engine, stalled badly this quarter. Unit revenues grew just 4%, down from 17% in the fourth quarter and 22% in the year ago first quarter. Sales were already on the decline, but they fell off the table this quarter, joining badly selling appliances and flavors. Particularly troubling are the results from Western Europe, which is SodaStream's biggest market, accounting for 60% of total quarterly revenues. In essence, it may have hit a saturation point. Sure, some of the contraction can be pinned on the lack of marketing as it allows inventory to clear in anticipation of its new appliances and flavors coming to market later this year, but that also underscores the pressure it's under to make sure they're a hit. While I do like the idea of its new adult beverage machine, there's little guarantee that becoming primarily a fizzy water company will provide the growth necessary, or that it can successfully meet the challenge of new and bigger rivals, yet that's where SodaStream International is heading. It needs to avoid Keurig Green Mountain's mistake and price its new products right, while at the same time hoping there remains enough of a market to grow in. That seems a dicey proposition right now and with so much uncertainty surrounding the company's transformation and its primary product, it's hard to recommend SodaStream International's stock.